2. Place the beans into a saucepan and cover with cold water. Bring to a boil then reduce the heat and simmer until beans until tender, about 45 minutes. 3. 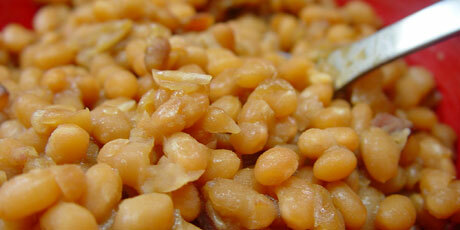 Drain the beans and place in a 4-quart ovenproof baking dish with a tight fitting lid. Add the maple syrup, bacon, onion, ginger and mustard. Bake until the beans have absorbed all the liquid, and are brown and tender, about 1 1/2 hours.